A short lived period of high pressure is over the forecast area today. A weak weather system is expected to begin to move into the region overnight. Southwest ridgetop winds have been moderate in speed for the past 24 hours. Winds are forecast to shift to west today and decrease to light to moderate in speed. Remote sensors report that air temperatures this morning are well below freezing at all locations within the forecast area. Despite cooler air temperatures over the past few days, the daily melt-freeze cycle has continued in sun exposed areas. Observations from across the forecast area continue to show a strong, well bonded snowpack below the surface layers at all elevations and on all aspects. On southerly aspects, the snowpack is well adjusted to the near daily melt-freeze conditions that have occurred over the past 6 weeks. On northerly aspects, snow surface conditions are a mix of frozen melt-freeze crust and wind scoured areas. Some small and isolated pockets of shallow unconsolidated snow linger on true north aspects at the upper elevations. Today, solar radiation will cause melting of surface snow in sun exposed areas. The greatest amount of melting will occur below 8,000' on E-SE-S-SW aspects. Only the top 1 to 2 inches of the snowpack is expected to become wet and unconsolidated. Wet surface snow is not expected to present a significant avalanche hazard to backcountry travelers today. The snow surface on northerly aspects is expected to remain frozen in most areas above 7,000'. Natural and human triggered avalanches remain unlikely at this time. Max. 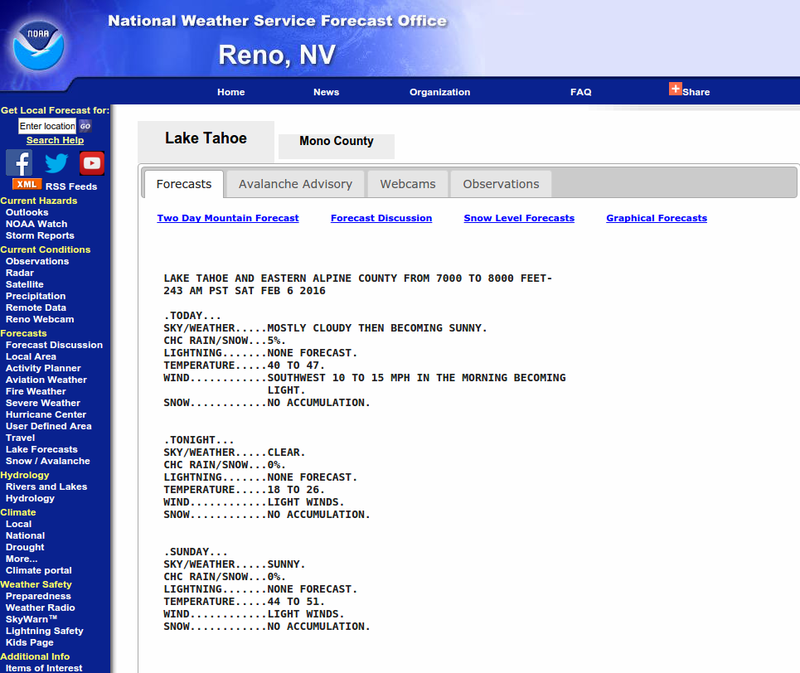 temperature at Sierra Crest past 24 hours: 32 to 36 deg. F.
Ridgetop winds forecast for the Sierra Crest: West at 15 to 25 mph with gusts to 40 mph. Today, partly cloudy skies with daytime highs 32 to 42 deg. F. West winds around 10 mph. Tonight, mostly cloudy skies with overnight lows 20 to 28 deg. F. Southwest winds at 10 to 15 mph. For Tuesday, cloudy skies with a chance of snow showers. Daytime highs 28 to 33 deg. F. Southwest winds at 10 to 15 mph. Winds increasing to 15 to 25 mph with gusts to 35 mph in the afternoon. Today, partly cloudy skies with daytime highs 22 to 32 deg. F. West winds at 15 to 25 mph with gusts to 40 mph. Tonight, mostly cloudy skies with overnight lows 16 to 26 deg. F. Southwest winds at 10 to 15 mph with gusts to 35 mph after midnight. For Tuesday, cloudy skies with a chance of snow showers. Daytime highs 18 to 28 deg. F. Southwest winds at 25 to 40 mph with gusts to 60 mph.